In the first phase of its top-to-toe refurbishment, London’s Mandarin Oriental Hyde Park is just emerging from behind a massive collage slash hoarding designed by Sir Peter Blake. The ambitious 18-month project which began last September has involved keeping the hotel running while a crack team - including local architects Purcell and Hong Kong-based design maven Joyce Wang - have worked behind the scenes to spruce up, in stages, all 181 rooms and public spaces. 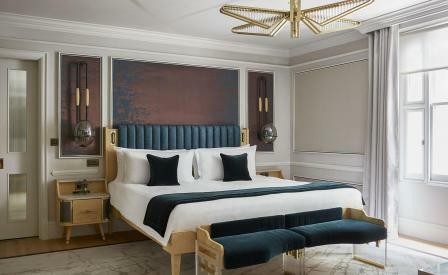 Wang’s design scheme is informed by the hotel’s location next to the city’s beloved Hyde Park. What might, in less experienced hands, have turned into a literal translation of arboreal themes, has, instead, been translated into subtle gestures. The reception area, for instance, is dominated by a glass chandelier that echoes a spring bloom. Acorns are palimpsests for light fixtures, and rugs hint of autumn leaves. In the Knightsbridge-facing bedrooms (the Hyde Park-facing rooms will be completed in the second phase), grey paneled walls frame a palette of Art Deco features, leather tufted headboards and bathrooms lined in Volakas marble. Elsewhere, Adam Tihany has been tapped to revisit the spaces he had originally designed for Bar Boulud and Dinner by Heston Blumenthal. The hotel’s iconic marque of the open fan for the lobby, meanwhile, has been reinterpreted by Jenny Packham, the British designer fashioning the rosewood spokes on the railings of the gates of Apsley House, and sprinkling sequins and Swarovski crystals drops over organza chestnut leaves.